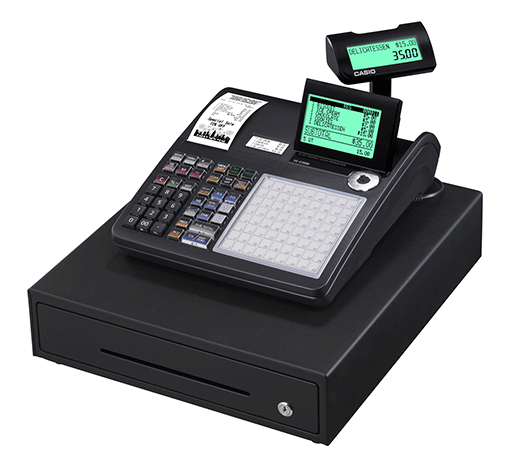 A cash register combines a secure cash box, advanced adding machine, and receipt printer into one operating unit. Many connect to credit card terminals and barcode scanners and some incorporate inventory and point-of-sale (POS) software for added functionality. We look at top cash registers for small business that deliver a range of features for a low price. Small business owners have two overall choices when selecting a cash register for small business. You can use a register-based system or opt for registers that operate using point-of-sale (POS) software. Cash registers work well for businesses that need a simple machine to tally sales, complete customer payments, print receipts, and store cash. POS systems do all of this plus offer a complete suite of business management tools, some at a surprisingly low cost. Standard cash registers touch on most of these features, but POS systems deliver a more in-depth set of management tools across the board. We’ll explore these differences below and you can learn more about them in our POS systems vs. cash register guide. We recommend Square as the best POS-driven cash register for small business because it delivers a complete suite of sales, payment, inventory, and business management tools for free. Plus, it also gives you several low-cost register options. Unlike traditional cash registers, with Square, you can process sales and run your entire business from your smartphone or tablet. Or, you can use one or more countertop registers to meet any in-store selling need. Here’s a look at Square’s cash register options, accessories, and pricing, along with Square’s credit card processing fees since that’s part of your overall cost of using Square. 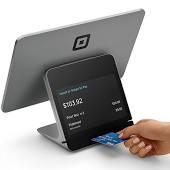 Square’s iPad stand register is a sleek countertop checkout that accepts magstripe and chip cards, plus contactless Apple Pay and Android Pay eWallet payments out-of-the-box. 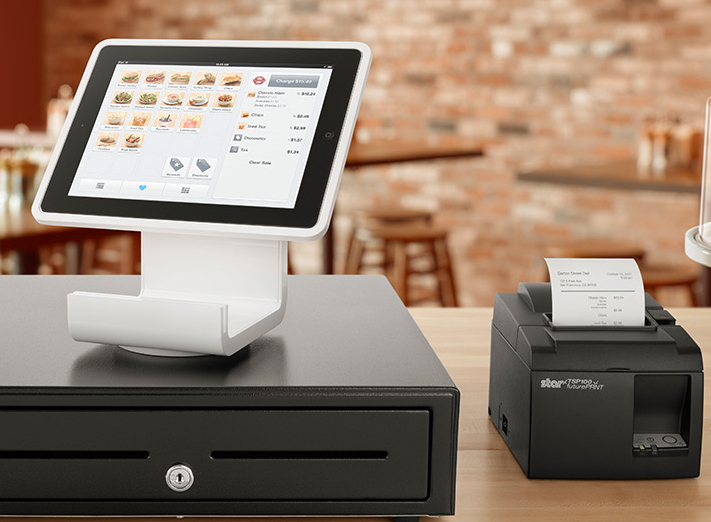 The new Square Register is Square’s sleek all-in-one countertop unit with a built-in touchscreen in place of an iPad and a customer-facing screen for display totals and payments. As shown above, Square’s POS software is free and your checkout register options are quite reasonably priced, mainly because Square makes its money from credit card processing fees. Square is what’s called an all-in-one solution that combines a credit card processing service, POS software, and cash register hardware in one system. Unlike the other register picks on our list, if you use Square’s POS register, you can’t rate-shop merchant account providers. But Square’s payment processing is very small business-friendly, with simple flat-rate fees and no startup or monthly account fees. Being a POS-driven cash register, Square does everything a standard cash register does, and plenty more. The only cash register for small business on our list that directly compares to Square’s full feature set is Lightspeed, which we cover later in this guide. Square even supports payroll and appointment management, which makes it a highly efficient cash register option for all types of businesses like retail stores and boutiques, spas and salons, and coffee shops and cafes. This is something that can’t be said of a standard cash register. However, Lightspeed, the other POS register on our list, serves these needs very well, but with a monthly fee. 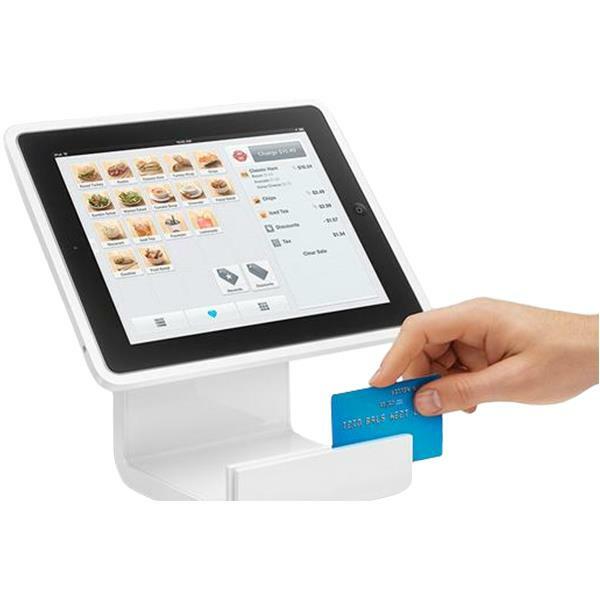 Since you purchase Square’s cash register hardware from them, they offer plenty of help for both setup and ongoing use. Your first stop should be Square’s excellent knowledge base, with step-by-step tutorials that cover every aspect of using the Square POS system and register hardware. 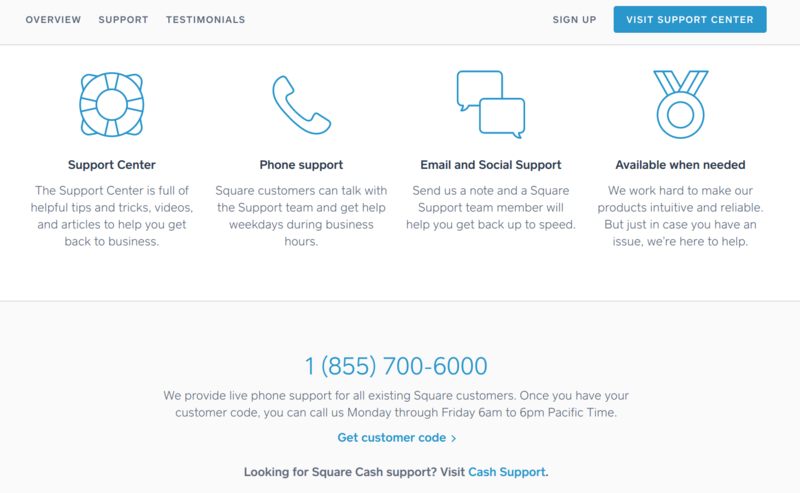 If you have questions, Square offers phone support Monday through Friday, from 6 a.m. to 6 p.m. PST. For assistance outside of these hours, you can reach Square 24/7 via email, and get fast answers via Twitter @SqSupport and on Square’s Facebook page. Square doesn’t let you use your own merchant services provider; you must use Square for credit card processing. All of the other cash register and POS options on our list let you connect your own merchant account for credit card processing. If you sell in high volumes or if your customers tend to use debit cards rather than credit cards, a traditional merchant services provider can offer lower processing fees compared to Square. However, many small businesses like Square’s simple all-in-one solution and competitive processing rates. Outside of this, when comparing Square to a basic or even advanced cash register, Square delivers far more sales and overall business management features for a very low cost. If you just need a simple cash register to complete payments wherever you sell, the Casio PCR-T280 electronic cash register offers a good set of sales features for under $100. Plus, it weighs in at 11 pounds for portability. Available on Amazon and through most office and retail supply companies, this compact Casio cash register has a proven track record of reliable performance for temporary market sellers and small retailers alike. As an all-in-one cash register unit, you don’t need to purchase a separate cash drawer and receipt printer—unlike the build-your-own cash registers from the POS systems on our list. However, to process credit cards, you’ll have to add a standalone terminal from your merchant account provider. This model does not have a connection for an integrated credit card terminal. 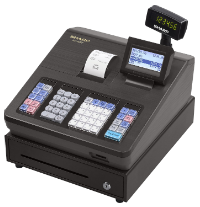 This cash register is a basic unit that’s designed to add items and calculate sales, add taxes, complete and record cash and check payments, print receipts, track user logins, and print daily sales totals. If you need a compact, portable cash register that does this, the Casio PCR-T280 delivers. Compared to the full set of options that more advanced cash registers on our list provide, and especially the POS options, this cash register is bare bones. But what it does, it does well. There’s not much customer support available on this cash register. You get an easy-start manual that’s, frankly, not very easy for the beginner. But it does walk you through the setup process and daily functions. The better resource for help if you run into problems is YouTube, where you can find all sorts of user-provided how-to’s for using this cash register in a real-world setting. This question depends on which cash register you’re comparing with the Casio. Compared to POS-driven registers from Square or Lightspeed, the Casio PCR-T280 leaves a lot to be desired. 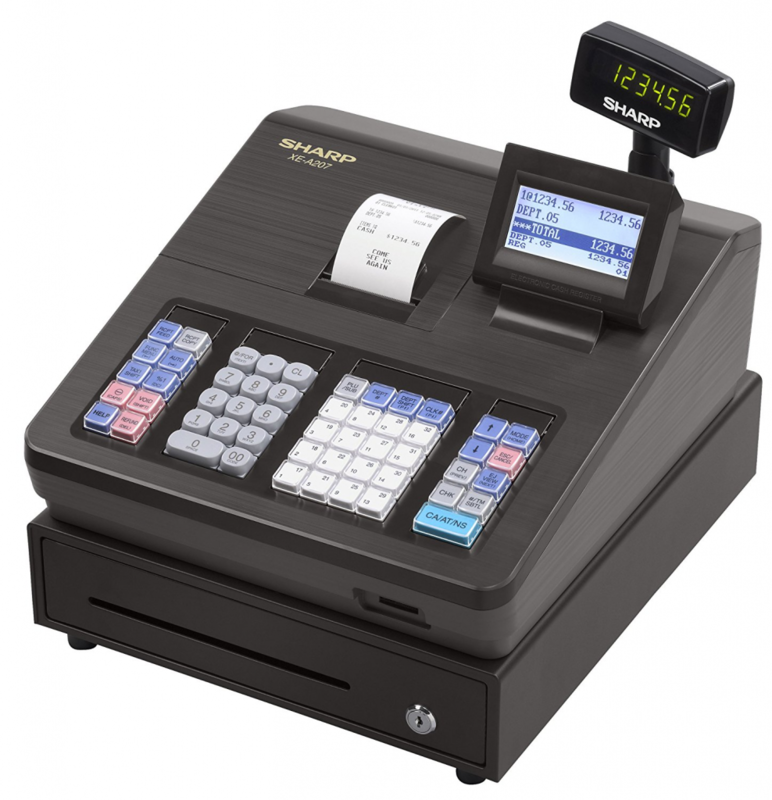 But compared to other cash registers on our list, it handles basic sales and checkout tasks for a very low price. The biggest drawbacks from a checkout perspective are the lack of credit card terminal and barcode scanner integration. You or your staff must enter every sale, credit cards must be processed via a standalone terminal, and charges reconciled manually. Also, because there’s no tab or tip function, this cash register isn’t a good fit for bar or restaurant operations. The Casio SE-C3500 offers a big step up in functionality from the bare bones PCR-T280 covered above. Ringing in at just under $400, the SE-C3500 is a fair jump in price, but for that, you gain many added capabilities. 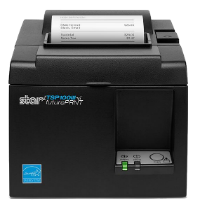 Most notably, the SE-C3500 stores up to 7,000 item prices, compared to the PCR-T280’s 1200, making it ideal for shops with large product lists. Plus, it supports an integrated barcode scanner and credit card terminal, has a user-friendly, spill-resistant keyboard with 72 programmable quick keys, tracks commissions for up to 50 users, and more. 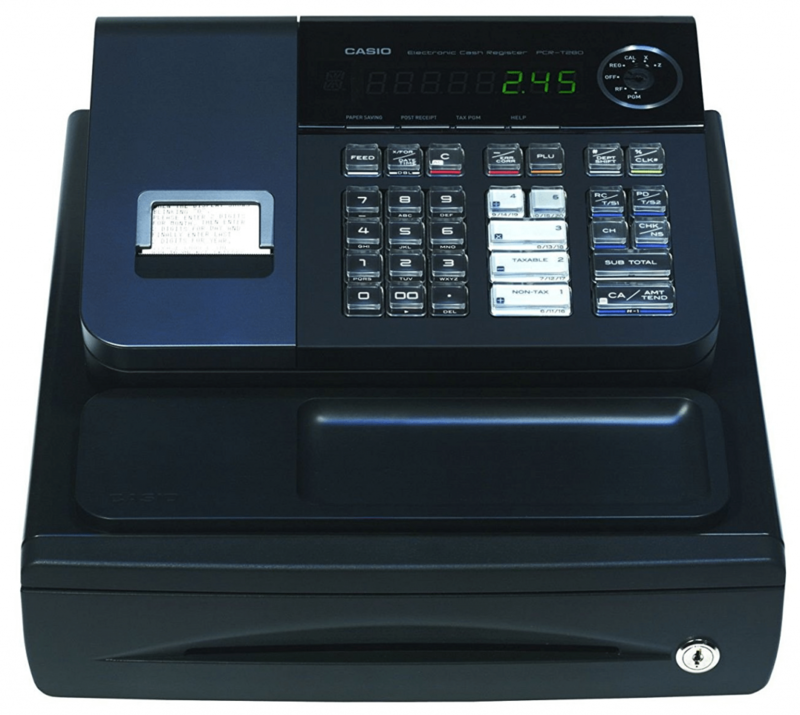 The Casio SE-C3500 is sold as an all-in-one cash register unit that includes a connected cash drawer and two built-in receipt printers. It also has two ports for connecting a barcode scanner (sold separately) and a credit card terminal, which you typically get through your credit card processing service. This model packs a lot of features into a reasonably priced cash register for small business. It offers far more than the basic Casio register above in terms of checkout efficiency, accessory integrations, stored items, staff commissions, and even food service features. There’s even an optional software package that you can use to simplify setup and handle sales data transfer to your PC via an SD card. But when compared to the POS-driven cash registers on our list, it still falls short of their far more complete inventory, customer, staff, and overall business management features. If you’re seeking a scanner-enabled cash register that supports a large price list but you don’t need, or want, the added POS features, then the SE-C3500 is worth serious consideration. Casio doesn’t offer much in the way of direct support beyond the manual that ships with the unit. However, most cash register retailers offer setup and ongoing support when you purchase from them. This model offers many customizable features in a cash register for small business, and the best place to check them out is on YouTube. While more advanced than the basic Casio cash register, the SE-C3500 still doesn’t provide any real-time inventory management or tracking tools, customer data capture or marketing features, or any integrations with online stores. For that, you’ll need a POS-driven cash register setup. However, the SE-C3500 delivers an efficient checkout, large product price lists, integrated credit card payments, PC data transfer via SD card, and enough added features to be useful to single-location retail and food service establishments. In terms of features and price, the Sharp XE-A207 falls between the two Casio registers discussed above. However, it delivers something that these, and many other budget-friendly cash registers on the market don’t—a link to your QuickBooks Pro software. With this, you can directly import your sales data into QuickBooks to streamline your bookkeeping and use QuickBooks to manage business tasks such as inventory tracking, purchase orders, and business reporting. It’s important to note that most POS-based cash registers also support QuickBooks imports and integrations. For example, Square has a direct QuickBooks integration and Lightspeed supports data exports to QuickBooks. Since a QuickBooks data download isn’t common in a budget-friendly cash register for small business, the Sharp XE-A207 stands out. 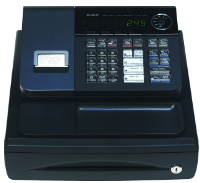 Like the Casios on our list, Sharp’s XE-A207 includes a locking cash drawer and receipt printer in one complete unit. This cash register doesn’t support a barcode scanner, but it does connect to a credit card terminal that you get from your merchant services provider to fully integrate credit and debit card payments into your usual checkout flow. Since the Sharp connects to a credit card terminal to integrate payments into your checkout, it beats the basic Casio out of the gate since that register has no terminal connections. It also supports a larger product list than the budget unit, with 2,500 stored products, but falls short of the Casio that holds 7,000 products. Other features and capabilities fall in between these registers, too, as you’ll see below. Like the Casios, the Sharp doesn’t match the power of POS-driven registers, which deliver an array of built-in inventory, customer, staff, and business management features. However, its QuickBooks data transfer via its PC Link software helps fill the gap. This lets you save transaction data to an SD card in a QuickBooks-friendly format. From there, you can also manage inventory, purchasing, accounts payable, customers, and staff. This solution isn’t quite as streamlined as a complete POS system, but it’s a good middle ground. Sharp provides far better customer service on cash registers than Casio. Their cash register support website features setup and operating videos, plus purchasers get one year of free technical support through the toll-free Sharp hotline. The manual that you get when you purchase the Sharp XE-A207 is very complete and written in user-friendly language, plus there’s an online set-up guide that walks you through every step needed to get up and running quickly. 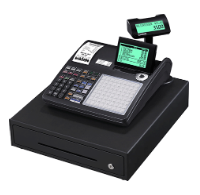 Like the other non-POS cash registers on our list, the Sharp XE-A207 doesn’t deliver a fully integrated sales, payments, inventory, staff, customer management, and business operations solution. You need to use QuickBooks to add those functions to your overall operation. Plus, you can’t add a barcode scanner like you can using the Casio SE-C3500 and the POS-driven systems on our list. 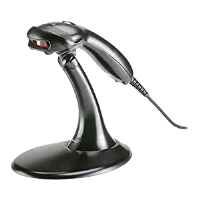 If you want a barcode scanner to speed up your checkout, you’ll need to look elsewhere. The Lightspeed POS-based cash register delivers a very comprehensive set of multi-store management tools capable of tying inventory, purchasing, staff, and business management tasks across multiple locations. As a POS-based register system, it lets you set up several registers in one or many locations and connect all data within one centralized, cloud-based software system. Square, our other top-rated POS-backed register, has a nice set of multi-location management tools too, but Lightspeed’s are more in-depth. However, both beat standard cash registers when it comes to multiple locations and complete operational oversight. Like Square, Lightspeed gives you several register options. Choices include tablet- and computer-based registers, to which you can add cash boxes, receipt printers, and scanners as needed. Unlike Square, Lightspeed’s cloud-based POS software is not free—you pay a monthly fee for access, as detailed below. Like Square, Lightspeed’s POS software supports mobile payments on smartphones and tablets so you can complete sales floor and tableside transactions. But unlike Square, Lightspeed isn’t a credit card processor. You need a merchant services account to process credit card payments using Lightspeed-compatible credit card terminals and mobile card readers. Like Square, Lightspeed’s POS-driven cash registers deliver far more sales and operational features than standard cash registers. 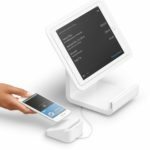 Like Square, you can build a cash register solution to meet your exact needs using Lightspeed, but it offers more register options than Square’s iPad-based system. You can build a cash register around an iPad tablet, or a Mac or PC computer, plus you can use Android tablets and iPhones as mobile registers. All of these connect to the shining star of Lightspeed’s feature set—advanced inventory management. A top reason that small businesses choose a POS register over standard registers is their ability to track stock counts, pricing options, and customer data in real-time. Here, Lightspeed truly delivers. Its advanced inventory management tools are top-notch, plus it has a robust purchase order system. For sellers managing large inventories and multiple vendors, Lightspeed’s fully integrated system takes the place of making daily updates on inventory spreadsheets and sales journals. Plus, you can oversee stock across store locations, in backroom or warehouse storage, and more. All of this just scratches the surface of the many features that you get using Lightspeed’s POS-based cash registers. Phone support is available 24/7 via Lightspeed’s callback request system. This is a nice plus for after-hours businesses like bars, restaurants, and ecommerce sellers. Lightspeed also has a convenient in-dashboard chat during business hours: Monday through Friday: 9 a.m. to 9 p.m., Saturday through Sunday: 10 a.m. to 4 p.m. EST, and you can email support as needed. Lightspeed also provides a comprehensive online knowledgebase that covers general and industry-specific setup and use. 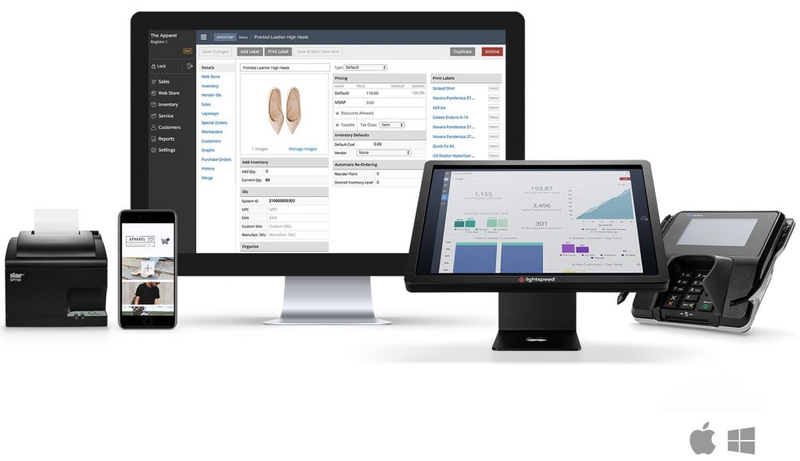 Lightspeed meets or beats Square’s POS functionality in many ways, most notably for inventory management, purchasing, and multistore management. But those advanced features come at a cost. Unlike Square’s free POS service or a one-time purchase of a cash register covered above, Lightspeed has monthly fees. Frankly, if your business is at a point where it can benefit from Lightspeed’s exceptional functionality, the monthly fee is a negligible cost compared to the operational efficiencies it provides. Many retailers and small businesses are making the move to POS-driven cash registers because they open doors to the many ways and places that customers shop and buy. Standard registers are inexpensive and make the checkout process faster and more accurate than hand-tallying sales on a calculator. But their connectivity to mobile devices, online sales channels, and even to other registers within the sales store is nonexistent. To get a complete handle on your checkout functions, business operation, and customer-focused sales and marketing, a POS cash register for small business is the best solution. Both of the POS-driven cash register solutions on our list offer fast setup and small business-friendly register costs. In fact, you can save on startup costs by using them on tablets or smartphones that you may already have. 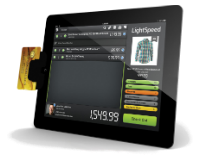 Lightspeed delivers the most robust, overall POS system but has monthly fees. If monthly fees are a budget roadblock, but you’re ready to enjoy the benefits of a POS-driven checkout, Square POS registers deliver a great set of features for no monthly costs.